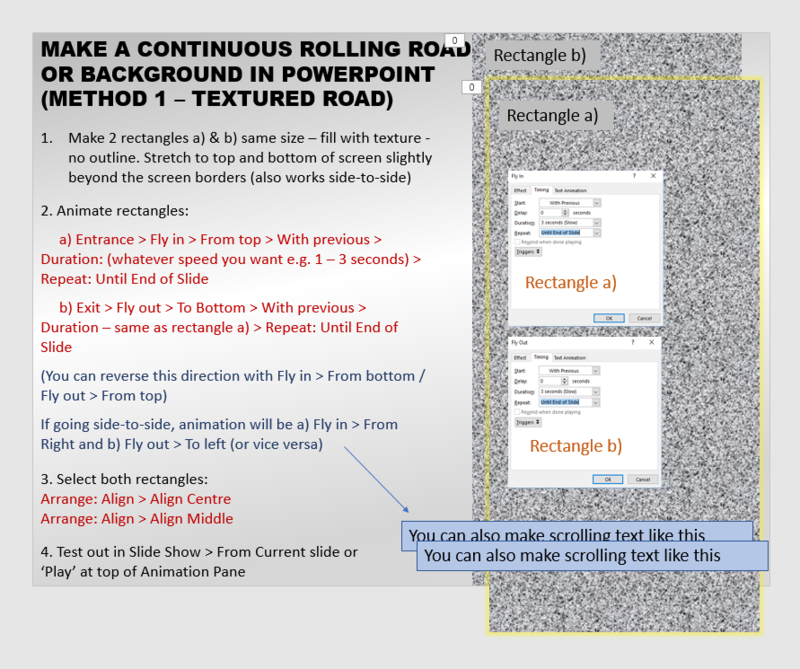 The screenshots below show you how to make a rolling road or background scene or even some scrolling text for an animation or game. There are two methods shown which can be combined if you want. 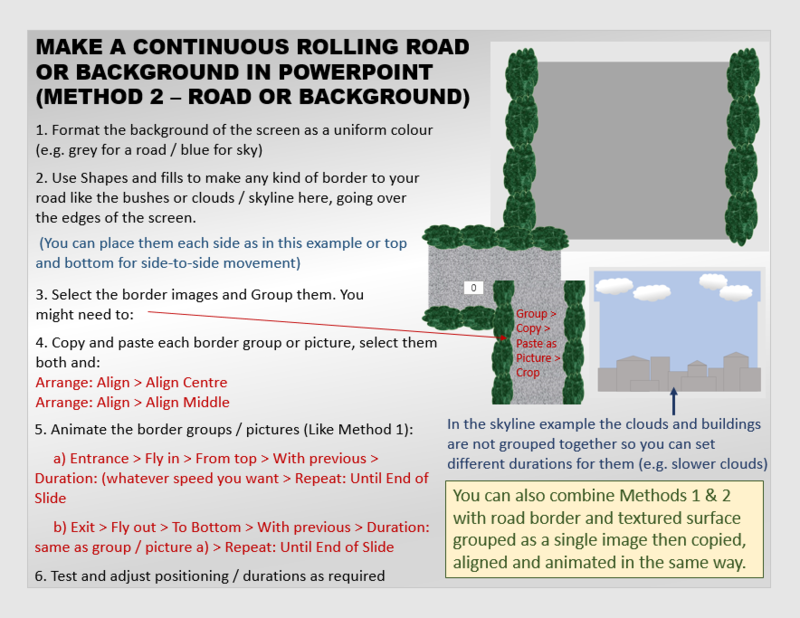 Once set up, all you need to do to make a game is to add some objects like cars, obstacles or flying things (e.g. with Motion Paths) which you could have to avoid or click-on as a maze game or shooting game. 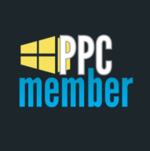 Check out the first PPC Challenge - It's about making a game or animation with this kind of scrolling background. #2 is where the slide is located, and the graphic is stretched over both left and right sides. I took #1 off the slide and aligned it flush against the edge of #2, and then applied a motion path to #3, which is also positioned flush on the other end of #2. Then, I deleted #2, and copied #1 so it has the same animation path. Aligned them so they're positioned on top of each other. Finally, I went to the animation pane, and had the second shape start its motion path halfway between and it works just fine. The downside to this approach is that it starts off with nothing as the first shape flies in, so I have a rectangle disappear when the second shape begins its animation and you don't see the white background behind. It's a bit counter intuitive, but the two pictures you use must be right on top of each other without any staggering of the timings and in their starting positions on the screen (not to the side or above / below). If you imagine it, one picture is exiting, leaving the screen to the left while the other one is entering the screen from the right - both moving at the same time so it makes a continuous loop when you add 'repeat until end of slide'. I've adjusted the Mystery Machine slides you sent, and will get them back to you to see it in action and the animations. Ok, I see where I went wrong. I applied the Fly in and Fly out to BOTH rectangles instead of one rectangle with fly in only, and the other with fly out. Sure thing - I'll get one done for you. Made video - added music - uploaded to You Tube - posted to Tutorials section - in less than 3 hrs. Holy mackeral... I'm shooting myself now. I've always done Custom Paths for scrolling (it was a trick I learned from Powerpoint spice on YouTube... and I never even thought about fly-in/fly-out)... Joker's Wild... You and me are gonna be having a talk soon! !